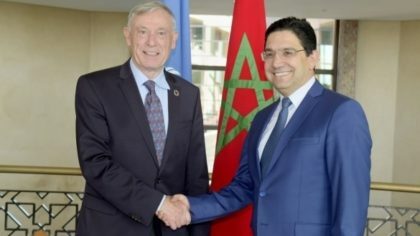 A year and a half after taking office, it seems that Mr. Horst Köhler, the personal envoy of the UN Secretary General for the Sahara, has made a diplomatic breakthrough. He has managed to bring the parties to the Sahara conflict to an initial roundtable meeting in Geneva this December 5-6 in a bid to relaunch the negotiation process in deadlock since 2012. Some Western press reports say the pressure exerted by the Trump administration also helped Köhler’s mission and pushed for relaunching dialogue on the Sahara. “It is time to open a new chapter in the political process”, said the former German president in his invitation letter addressed to Algeria, Morocco, Mauritania and the Polisario separatists to the Geneva meeting, the first of its kind in six years to be held amid mixed views, stands and low expectations. It is the first time that Algeria will sit in the table as a party to the regional dispute over the Sahara and as a main stakeholder in the process aiming to find a political, realistic, practical and lasting solution to the conflict. This first round table will test the good-faith of Morocco’s neighbor, Algeria, which arms, funds and shelters the Polisario secessionists. For decades, the Algerians have denied their direct involvement in the Sahara, but they were caught red-handed providing logistic supports, diplomatic passports, planes and funds to Polisario members to carry out anti-Moroccan campaigns worldwide. In his speech of November 6th, King Mohammed VI reached out to Algeria offering direct and frank dialogue in order to settle all differences impeding the development of relations between the two countries. However, the Algerian authorities have not so far responded to the Moroccan initiative to break the stalemate in bilateral relations. Rabat is convinced that better relations with Algiers would help solve the Sahara issue, unlock the huge potentials of the region and enhance its stability. Morocco insists that the autonomy plan offered for the Sahara should be the basis for any negotiation, while Algeria and the Polisario still cling to the organization of a self-determination referendum, an obsolete option deemed unworkable by the UN due to everlasting disputes over eligible voters. On the eve of the Geneva meeting, UN Secretary General Antonio Guterres urged all parties to engage “in good faith, without preconditions and in a constructive spirit in the discussions”. He also called upon the parties to demonstrate political will in order to advance the negotiations, emphasizing the importance of an enduring political solution to this regional conflict. As the Geneva meeting opens this Wednesday (dec.5) in a bid to revive stalled talks on the Sahara, many analysts wonder whether this new phase will bring new hopes for a lasting resolution of this conflict or lead to another sterile cycle of Manhasset talks ?. Despite the gap between the parties to the conflict, some experts say that the current UN Chief (former Portuguese Prime Minister) and his personal envoy for the Sahara, German Horst Köhler, a child refugee himself during the Second World War, might be able to make a breakthrough. The two men are experienced politicians and determined to resolve this conflict in an era of new geopolitics, taking into account the “credible and realistic” autonomy plan put by Morocco on the negotiating table. The Moroccan offer, backed up by huge investments in the Sahara, gives more local administrative control to the Sahrawi population under the umbrella of the sovereignty of the North African Kingdom. This plan, which will improve further the local population’s socioeconomic situation, enabling them to manage their own affairs while respecting their traditions, is already creating the “new dynamic” on which Antonio Guterres and Horst Köhler are looking to build up a compromise to end the sufferings endured by the Sahrawis in the Tindouf camps (Southern Algeria) for more than forty years.